These large, soft, alcohol free wipes come in a handy softpack dispenser. The special fibers are impregnated with a fluid designed to gently cleanse and moisturize the skin, while removing surface impurities. The washcloth ensures quick, efficient and gentle perineal care at each incontinence product change, and can also be used for gentle washing of the whole body. Contains dimethicone, aloe and chamomile. Soft, pre-moistened wipes for fast, gentle and effective skin cleansing. Safe and convenient for waterless bathing or skin cleansing anywhere on the body. Low profiles pack is designed to fit in a drawer, helping to reduce bedside/table clutter. Cons:Not sure if they would be septic tank friendly so I don't take a chance flushing them. More trash to take out, but the used wipes don't smell up the place when removed regularly. Pros:Come out of package neatly without pulling or tearing. They are made in USA which is what I usually look for first. Cons:None that I can think of so far. Pros:Thick enough to prevent tears and the snap lid prevents drying out. Cons:Could be slightly wider, but not a major issue. love how big they are! 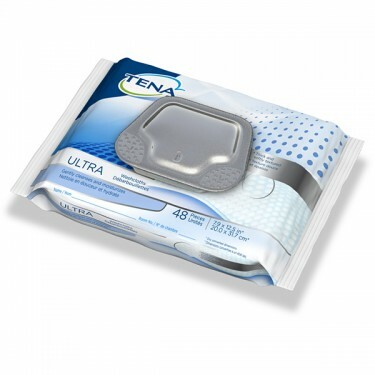 I think these Tena wipes are wonderful. I use them as a bedside bath because of not being able to stand long. They are just wet enough and the slight scent to them is not too overpowering. I will buy these again, Thanks TENA! Pros:big, cleans well, and convenient for everyone.